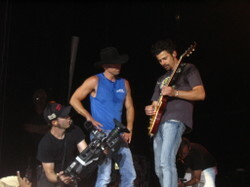 Lots of pictures of Kenny, between Andrea and I over 300 I think.... 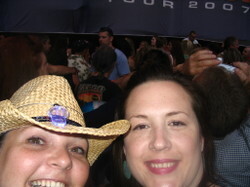 The last few are Andrea and I in the Sand Pit with the big Kenny Curtain behind us after 5 1/2 hours of music and waiting for Kenny. 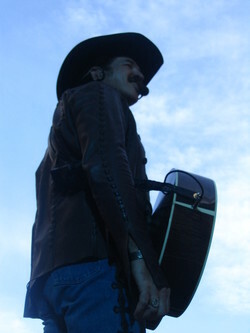 Next is Kix Brooks of Brooks and Dunn, and yes that really is how close we were to him. 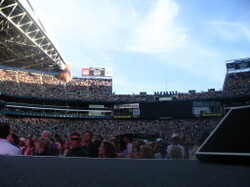 He was really great, his buddy Dunn was kinda boring though.... and the last is from the Sand Pit looking into Seahawk Stadium/Qwest Field and just how huge it was. It was a awesome 24 hours and now my feet still hurt as well as my throat from screaming. We are back home now, so feet are up and now I watch the tour to catch up on the days 1st stage...... Thank you Kenny!!! I constantly glance at my huge desk calendar to make sure I haven’t scheduled meetings for….well, actually for three weeks in July. I’ve become obsessed with the color yellow and like to dress in yellow and even buy yellow flowers; no other color is acceptable. I’ve erected a miniature Eiffel Tower on my front lawn. The neighbors wonder what’s up with that? And I walk around saying Bon jour all day. I’m looking into buying a poodle and I don’t even consider that a real dog. Tour Fever: that’s what ailing me. I’ve got it bad now and I seem to get it every July. I’m preparing myself for the full break-out, which will hit around July 7th. 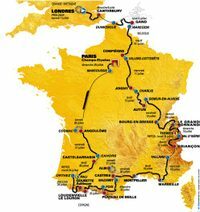 At that point my entire being will revolve around the Tour de France. I will set my alarm and get up to watch television every morning at the crack of dawn on the west coast of Oregon, usually around 5:30 a.m.
Heck, I’ve gotten up as early as 3:30 to watch a stage and YEAH, I know it’s re-aired time and time again at more reasonable hours throughout the day. But I have TF, and TF sufferers need it live – need to see it while it’s unfolding. There are no TIVOs for true TF sufferers. Sure, those afflicted will go to the DVR to review an entire 5-hour stage later, but I myself see no advantages in risking missing a single live stage. And I don’t want to hear the results or details about it from others. No, thank you. Tour Fever. It makes me happy to get up early every morning in July. It’s when I get inexplicable urges for fine French food, Cotes du Rhone, croissants and cheese. It turns my life upside down for a full three weeks while I watch the greatest sporting event in the history of mankind. The competition, the human drama, the strategy, the failures: it all plays out on the roads of France for my personal enjoyment. Kenny Chesney here we come!!!!! Andrea and I head to Seattle tomorrow morning to see my beloved Kenny. I need to thank my lucky stars that I have such a wonderful friend in the local Cruzan rep. For the 3rd year in a row I got the hook up to see Kenny and every year it gets better and better. The first year Andrea and I went and had tickets to the "Sand Pit" which means in between the stages but so close you can touch him when he walks by..... 2006 I had tickets in the 12th row, which seemed so far away after the previous year, but luckily the 12th row is actually the 2nd row in front of the stage and I got to go back stage to meet him..... 2007, we are back in the Sand Pit, get to go backstage and meet him again and also get to go to the pre-concert party with free drinks and food...... still working on what I will even say to him....maybe I should ask him if he likes to watch the Tour de France???? I think I will go out and get some paint to write Kenny or Bust on Andrea's car..... I think Tom would love us doing that to his car. How am I going to sleep tonight with all this excitement tomorrow? Besides the amazing moment of time that I had at the Kenny Chesney concert, the rest of the weekend was a ton of fun as well. Mom and I left Portland after stopping at Starbuck's (of course) and headed to Seattle. Upon arriving we went to the University Village shopping area by UofW and ran into their large sidewalk sale. Lucky for us Pottery Barn had a bunch of beachey things on sale that we picked up for the beach house. We had lunch at the Pasta & Co and then onto the hotel. We stayed at the Hyatt in Bellvue which was very nice and it was nice not being in downtown Seattle. I can't stop thinking about meeting Kenny, and really how could I. For that 60 seconds it seemed that I was the only one in the room. It is really neat that somebody as big as that can take that time out of their day and make his fans feel that way. 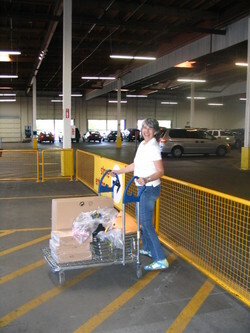 Sunday morning we stopped at Ikea on the way home and bought some storage pieces and some more little things for the beach. Mom had never been their before, she was amazed. We came home to 101 degree heat, one of the trees behind her house fell and landed on the power line, started a fire and then broke the line. We had a lot of fun and it will be a weekend I will remember forever! 60 seconds of a lifetime! I am a little sad today that now it is over. 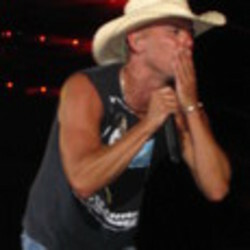 My 60 seconds of time that I shared one on one with Mr. Kenny Chesney. this is how it went down: upon arrival at Qwest Field we had to walk what seemed like 5 times around the entire outside of the Stadium to find the "Correct" Will Call booth, to pick up my instructions for the Meet & Greet. It said "Meet at the Southwest corner of the field level concourse by the Silver Seahawk sculptor, you won't miss it, at 7:30pm" When we arrived it was about 5:30 and the first act Blane Larsen had already come. Last year when I went we had "Sand Pit" tickets which was between the stages and you were so close you could touch Kenny as he went by. So when I got my 15th Row Field tickets I was a little disappointed. Well, the stage was a T shape and the Pitt wasn't really there, BUT since we were in the center section in front of the T, row 14 was really the FIRST row. So we were in the SECOND row from the stage, and I would say that was even better than last year. Back to the Meet and Greet; I talked to about 6 security guards before somebody could tell me where I was suppose to go. I finally found "the giant Seahawk" and met the Cruzan national rep and he gave me the run down. Kenny was not going to sign anything or take any personal pictures, you will be in pairs of 2 when you meet him, he then gave me a laminated badge that Kenny had just signed and told me that he would take the picture and that I could come back after the concert and pick up the picture. There was about 15 or so people in the group and I was the only one by myself. As I stood and waited, I saw Kenny walk into the room with a few other guys, then I started to get nervous, what was I going to say? The first time I talked to Martha Stewart on the phone I was ok until the end of the phone call when I screamed "I love you Martha" So I thought I should try to keep my cool with Kenny face to face. 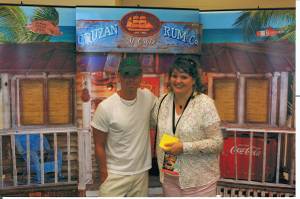 We were finally ushered in, and as I went into the door, there he was standing in front of a large Cruzan Rum backdrop and taking pictures. I was so nervous, and sooooo excited at the same time. I was the 3rd person in our group, with 2 girls in front of me. The Cruzan guy told the first two girls to go and they walked up and talked to him and took a picture. I wasn't sure if he was going to make me go with somebody else or by myself, sooooo then he said "Go ahead" I walked to Kenny and he put his hand out and asked my name and I said "Hi, I'm Claudine" and Kenny said "Hi Claudine, how are you" and then I said " I'm great and it is such a pleasure to meet you and I am a huge fan of your music" He then PUT HIS ARM AROUND ME, RUBBED MY BACK AND SAID, "oh thank you sweetie that means a lot" We took the picture, he shook my hand again and then put his other hand over mine and I said "thank you so much" and then I left. I think when I left the room, I just might have been floating at least 5 inches off the ground and could have screamed at the top of my lungs. It was by far the most amazing thing that has ever happened to me and I don't think I could ever forget it. I know at this point my husband and everybody is making fun of me, but I really don't care! the day has now arrived!!! 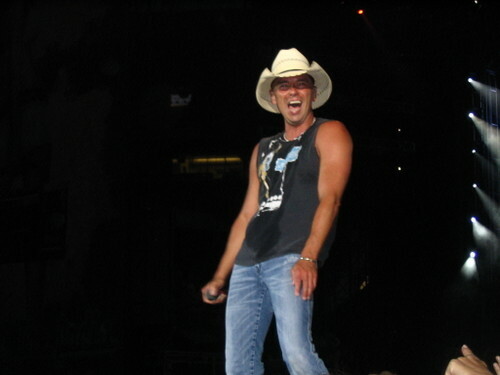 At approximately 7pm PST I will have my long awaited (but I am sure very brief) moment with (Andrea look away) Kenny Chesney!!!! Heading out this morning with Mom to Seattle for some shopping and maybe I haven't mentioned, KENNY! 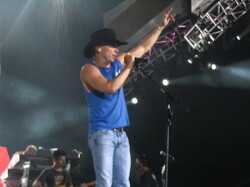 With Kenny will be Gretchen Wilson, Big & Rich and Dirks Bentley. It should be a great show. It is suppose to be in the high 90's in Portland but cooler in Seattle thank goodness! Could it really get any better? It really couldn't get much better than this! 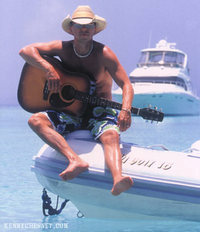 I found out today that not only do I have two floor tickets to see Kenny Chesney next month in Seattle, but, are you ready for this? I also am getting 2 MEET & GREET tickets. 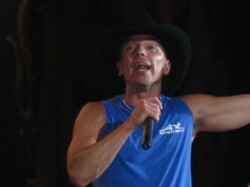 And who will I be meeting and greeting you may ask....... that is right my darlings, MR KENNY CHESNEY........ holly cow what will I say, I think I will freak out. What is not to love, Kenny Chesney won the entertainer of the year award last night at the Academy of Country Music Awards. and even better yet only one month from today will I be standing in the Sand Pit close enough to touch him at his Seattle show. But the real question is who was the chicky sitting next to him?